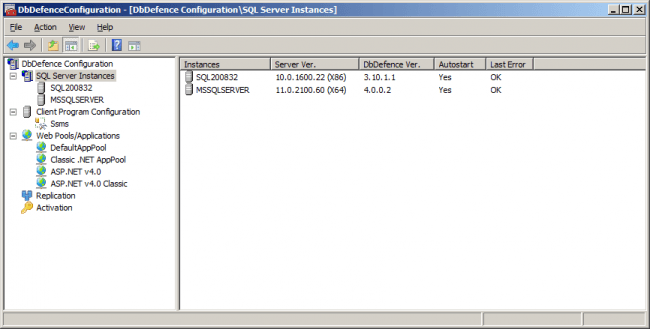 The Configurator shows SQL Server instances with installed DbDefence. When Autostart is turned on, the SQL Server loads dbdefence.dll from the Binn folder immediately at start up. When you turn it off, Configurator renames the DLL to dbdefence.dl.disabled, which prevents loading at the next SQL Server start. Other values are useful if you want to submit a bug report. The Client Program Configuration allows configuring client applications to unlock protected databases automatically. This is one of the unique features! You can encrypt a database and allow only your application to enter the database without a line of code. Passwords are stored securely and can't be copied to another server. We recommend digitally signing your application to achieve maximum security. Password assignment is similar for Client Programs Configuration, Replication and Web applications. You can setup passwords for all applications and for all SQL Servers or setup passwords for a specific application and specific SQL Server. 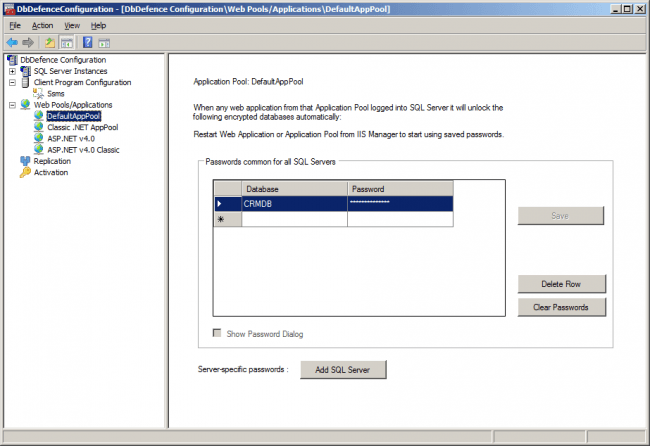 Setting passwords for all servers may slow connections to the SQL Server because the application will try to unlock databases that will not necessary be used. If you want more performance, be specific. You can configure any executable file (.EXE) to Client Program Configuration. Right click on Client Program Configuration and select "Add Program." By default, you set passwords which are stored for Current User. Note, if your application runs under different credentials it will not see passwords entered for Current User. After you setup passwords, click Save. It may take several seconds to store passwords. After passwords are saved, the Save button is disabled (may take several seconds). Now you may start your application as you usually do. 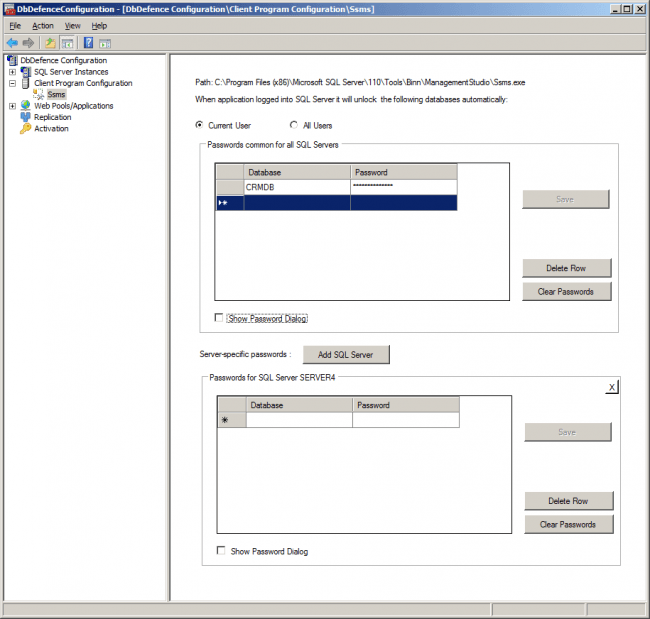 As soon as it is connected to the SQL Server, it will apply passwords depending on the configuration. If you check Show Password Dialog box, the system will check the target SQL Server and show you the dialog only if there are protected databases that are still unopened. If there is no such databases, nothing will happen. More about Client Program Configuration. This item appears only if setup detected valid IIS7 or IIS6 installation. You may setup passwords for web applications. More about it. Sets passwords for a replication process. There are some rules specific to replication. More about it. Activation Activates a SQL Server instance with a purchased activation key and instantly turns your free version into a full-featured version. More about it.